August is upon us, London is heaving with groups of painfully loud Spaniards and irritatingly slow camera clicking folk from the Orient. The City is on hibernate mode, all motorways and A Roads are crawling at a pace that even a snail would laugh at and of course, the Tube is stiflingly hot. The Criterion, however, is rather busy. A restaurant with a long and sometimes slightly chequered past is overcoming all the doom and gloom of recession and is fast becoming THE restaurant to go in Central London. Slap bang in the heart of Town, Criterion is famous for being the place that Stamford took Dr Watson to in order to introduce him to the great, if slightly crazy Sherlock Holmes in Arthur Conan-Doyle’s famous book. It was a restaurant then, and still is. 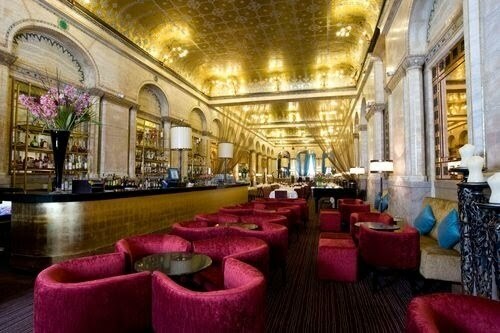 Now independently owned with a newly (and extremely carefully) cleaned gold mosaic ceiling, some oversized chairs and decent lighting it still oozes grandeur and sophistication. I had been looking forward to my lunch there for a while and had been instructed that I ought to try a signature dish or two. Greeted with a chilled glass of fiercely bubbling Champagne we got comfortable in the afore mentioned oversized chairs and began to discuss the reason for our lunch – London Restaurant Festival which, I might add, is going to be epic! The bread was subtly placed on the table with some very homemade looking butter, I was of course aware that Chef Matthew Foxon is known not only for the wondrous food that come out of his kitchen, but for the time, effort and creativity that goes into it all. The butter had, of course, been churned on site and the bread (that smelled divine) baked on site as well. I, rather reluctantly abstained from the bread an butter because, being the greedy little so and so that I am I had ordered a starter that contained scallops and truffles and a main that included a fillet steak and Fois Gras – all this for a Wednesday Lunch!!! My starter of pan fried scallops, pea and truffle puree, pancetta, pea cress was just heavenly. The truffle in the pea puree was so finely balanced that all flavours could be distinguished, and the scallop – perfectly cooked was divided in two by a fantastically crispy bit of pancetta. The main course, although I really really didn’t need it on a weekday lunchtime, was heaven. Look at the picture below, it really did look like that! 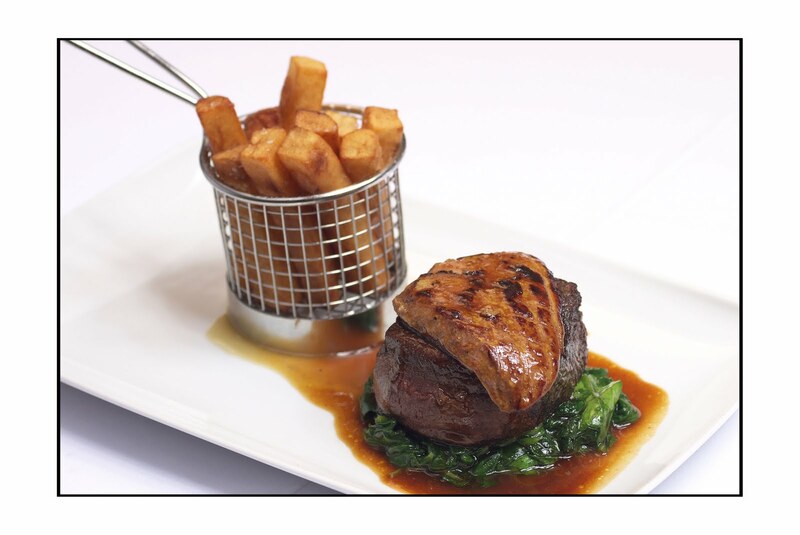 I must say, for all my expensive tastes, I usually prefer a Sirloin Steak,but this fillet was beautiful, gorgeous and pink and tender and and and…… The Pont Neuf Chips in their little basket were some of the best tasting chips I’ve had in a long time, and because of the basket, they didn’t go soggy in the jus! We tried several desserts… All miniature versions of the normal menu. And I can’t fault them. All in all, the service was fantastic, the food was divine and the place itself; really something that has to be seen to be believed (in a good way!!). Here comes the cliche, this restaurant really is, I believe, rising from the ashes and is set to be great, very great indeed. Keep an eye out for the Criterion as you walk through Piccadilly and during the London Restaurant Festival. It’s well worth a visit.